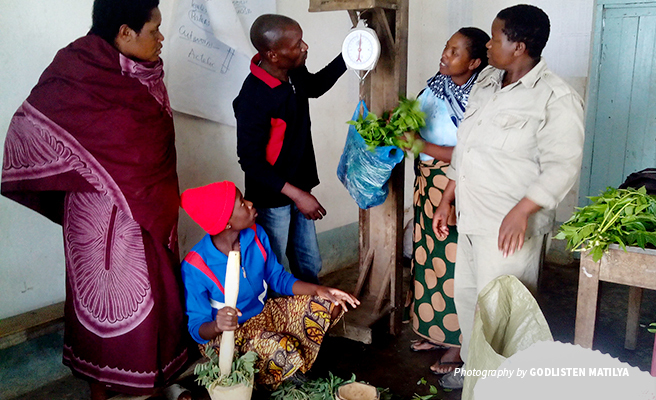 With the Isangati Agricultural Development Organization, a local agriculture group that provides extension services to farmers, AWF selected nearly 300 farmers representing 17 villages, from three key districts (Mbeya, Rungwe, and Makete), to train on sustainable farming practices. Initial meetings with village governments and general assemblies — an important step in introducing the concept of conservation-friendly agriculture — identified maize and Irish potato as key crops with an extensive base of farmers. The farmers acquired a new outlook on agriculture management using one-acre demonstration plots. 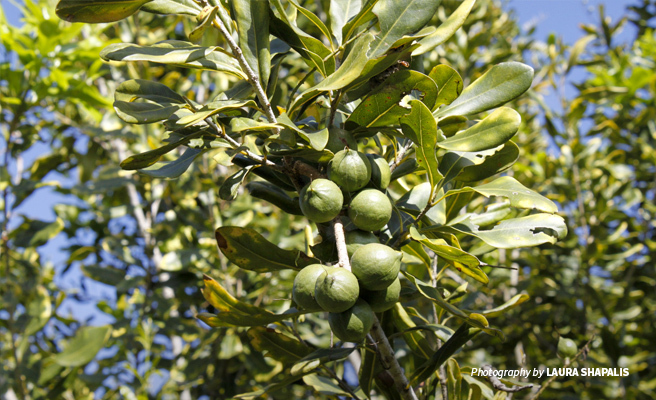 They learned sustainable approaches to boost productivity while ensuring that on-farm and post-harvest techniques have a minimal negative impact on crops and biodiversity in the wider ecology. AWF-trained farmers shared their newly acquired skills with hundreds in their districts, increasing the number of households adopting the sustainable-agriculture approach by 70 percent in the next farming season. Sixteen demo farmers were also further educated to become local trainers and soon extended their expertise to more than 40 villages outside the project area. Conventional farming has created a cycle of dependence on harmful and expensive chemicals. Before the training program, many farmers in the area used expensive fertilizers and pesticides to maximize crop yield. Not only are these industrial products expensive for village farmers, but they are also difficult to access as supply stores are located in larger towns and have dangerous consequences for farmers and natural resources. Over time, these farming chemicals deplete soil health and the runoff from the farms contaminate nearby water sources. Harvests continue to decline with poorer soil and many small-scale farmers are pushed into debt. To reduce reliance on industrial agrochemicals, the sustainable agriculture trainers showed farmers how to make fertilizer using farmyard manure, weeds, and cleared bushes. This environmentally friendly fertilizer is safer for the land and surrounding water sources and it is also 50 times less expensive than buying chemical fertilizers. Locally abundant plants became the source of organic pesticides — from neem leaves and garlic to herbs like the Vogel's tephrosia or fish-poison-bean, as well as small fruits like the Sodom apple and hot pepper. In just a few months, farmers using the new conservation-friendly methods reported drastic yield increases compared to farmers using intensive chemical-heavy methods. Maize and Irish potato harvests grew threefold per acre and the costs of farm inputs reduced by up to 80 percent. Without a reliable market, farmers risked losing some of their harvests to spoilage. AWF facilitated demonstration farmers to join the Vodacom Agriculture Club to find market information and connect with buyers using their mobile phones. At the same time, our successful partnership with the Rungwe Avocado Company has helped integrate conservation values into the farming practices of its 3,500 smallholder out-grower farmers in the Rungwe District. Many villagers who had struggled for decades have used the additional income from their improved sustainable agriculture enterprises to address pressing domestic needs. One farmer installed electricity in his home for the first time; others were finally able to repair their homesteads. 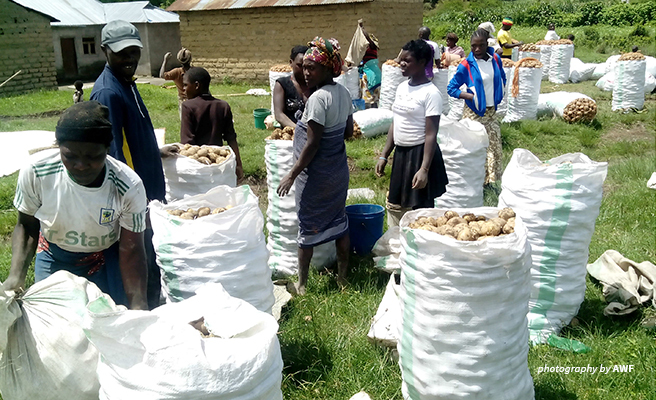 A livelihood impacts survey conducted in the Mbeya District showed that many demo farmers have already strengthened their food security, nutritional status, and income sources. Some bought additional land to expand sustainable crop production and others started new environmentally sound projects. Of these, more than half developed businesses for improved seed. Others diversified into different types of agriculture — 11 started poultry projects, four set up dairy cattle farms, while six started dairy goat projects. One farmer who has been running a small poultry project since 2017 recently started a piggery, with big dreams of becoming Mbeya’s biggest supplier of chicken and pork. A demonstration farmer who started with one dairy cow in 2016 invested in two more cattle and tripled his daily yield to 27 liters. He is now the owner of a kiosk in Mbeya, employing a local salesperson. Even after providing milk for family use and paying wages, he earns a net profit of TZS 34,000 (US $15) per day. At the same time, he has maintained a high yield of potato and maize from his farm. He recently donated one dairy cow to his neighbor whose children were suffering from malnutrition. Some of the AWF-trained farmers who have since ventured into dairy farming are even working to make the switch from firewood and kerosene to clean renewable energy by installing biogas plants. Farmers who have invested their sustainable agriculture profits outside of farming remain advocates of sustainability. For example, one farmer’s restaurant — started using capital from her improved crop yields — is so successful that she employed another woman to support her. 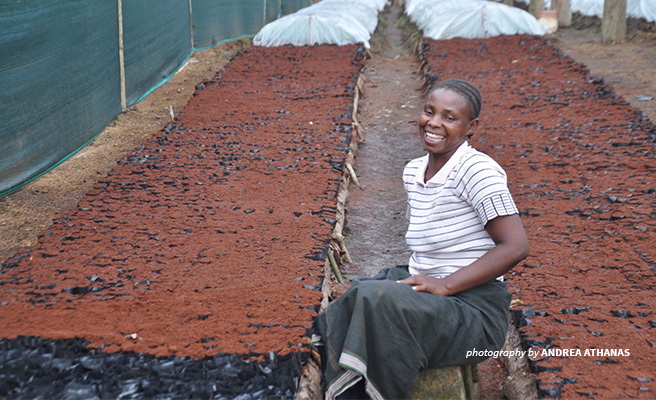 Like others who have adopted sustainable agriculture in Mbeya, she is sharing the benefits and building a strong foundation for the growth of the local economy. Hailing from the Kilimanjaro region of Northern Tanzania, Godlisten joined African Wildlife Foundation as the Program Coordinator for the Reducing Emissions from Deforestation and Forest Degradation (REDD) program in 2010. In his current role as Program Manager, Southern Tanzania, he oversees AWF’s community-based water conservation initiatives in the region. Godlisten has more than 20 years of conservation experience and holds an M.S. in conservation biology from the University of Cape Town.